Blue Turtles is a manufacturer and wholesale supplier of silver jewellery, based in Melbourne Australia. Blue Turtles was founded and is owned by us, Doron and Sandy Berger. Committed to the principles of personal excellence, we’ve been creating exquisite and vibrant sterling silver jewellery with an inspirational edge since the year 2000. Our passion and love for crystals and gemstones, combined with a deep appreciation for natural beauty, are responsible for our collections of beautiful and inspiring jewellery. Personal excellence is the force that drives us to maintain, on principle, our habit of handpicking the stones we use in our collection, one piece at a time. It’s what compels us to maintain high standards in the quality of our silverwork. It’s what ensures that the products we deliver to you are impeccable! It all started in 1991 when Doron quit his well-paid accounting job to grow his hair and travel the world (a journey that changed his life in many ways – but that’s a whole other story). On the island of Flores in Indonesia, Doron stumbled across an old man sitting on the side of the road, selling rings made from agate and tin. His childhood passion for coloured stones suddenly rekindled, Doron felt immediately inspired and bought the old man’s merchandise. Some time later he laid out those rings on a piece of red satin cloth on the cobblestones of Jerusalem, and in no time they’d sold. Doron knew that he would never need to be an accountant again! From those humble beginnings, Doron learned and experimented, traveling to new places in the quest for knowledge and experience – he traded in the mud at Glastonbury Festival, ran stalls at Camden Market in London and the markets of Byron Bay, sourced and manufactured in different corners of the world – and finally he transformed himself into a wholesaler late one summer, whilst driving the entire east coast of Australia in a little blue van. All along the way Doron developed the skills and forged the relationships that allowed a wholesale jewellery business to evolve. Blue Turtles was officially incorporated in the year 2000. When Doron and Sandy met in Indonesia in 2001, a new chapter began – for both Doron and Sandy, and Blue Turtles! Sandy’s a special soul – a strong woman with a good grasp of the modern world, but with a heart finely attuned to the wise ways of the ancient Javanese. The important principles of harmony and making a positive difference in the world are her way of life. With the help of Sandy’s wonderful outlook, intimate understanding of Indonesian culture and excellent interpersonal skills, a wonderful team of silver artisans based in Bali was gradually assembled and a high standard was set for all at Blue Turtles to follow. From the very beginning, Blue Turtles was seeded from true passion. In creating Blue Turtles we’ve followed our hearts, and we remain committed to maintaining our passion and focus. This is our Labour of Love! Something very central to our lives is the importance of our personal growth. And in our world-view, personal growth and fulfillment depend on the practice of integrity and excellence – we believe there can be no true fulfillment without being true to ourselves, doing the best we possibly can, and making an effort to make the world around us a better place. As we were inevitably spending so much of our time focused on our business, we realized that it made sense to structure our business to reflect our most personal world-views. So, we evolved our work ethic around that view. We strive for excellence in every aspect of what we do, and we endeavor to create benefit and opportunity for those with whom we come into contact. This includes our artisans and other team members, and it includes you, who ultimately pays us the highest compliment by buying and wearing our jewellery. We make it our duty to put ourselves in the shoes of all these people as we create our jewellery and provide our service. To better understand the principles that guide us, read our Vision and Mission Statements. At the origin of our beautiful creations are the minds and hands of talented human beings. Though a handful of our collection comprises items that we source, the vast majority of our jewellery begins with Doron, who personally hunts out every stone and designs each jewellery piece, one-by-one. It’s done with simplicity, using pencil and paper, rather than relying on computer software – we want to maintain the human touch in our pieces, an important aspect of Blue Turtles’ principle of true artisanship. It’s then over to our talented artisans who turn those designs into beautiful jewellery. Our artisans are a mixture of Balinese and Javanese craftsmen, who are grounded in traditional silverwork techniques, but open to modern innovation. It’s important to us that they have real passion for their craft, because it’s that passion that makes the difference between mere production line jewellery and a vibrant jewellery piece that brings real pleasure when it’s worn. It’s a pleasure to watch them at work – they move slowly and fluidly, pausing to take in what they’re doing, caring about the result. As a team we’ve managed to successfully combine the energy of hands-on, traditional jewellery making with contemporary style, and a modern eye for accuracy and high quality. The result is beautiful, premium quality contemporary jewellery that retains the aura of the human touch. Our family of artisans is something that has taken time to build and develop. The people who’ve successfully grown together with us are the ones who also hold personal excellence and the welfare of those they work with as important principles. Bli Made hails from Bali. 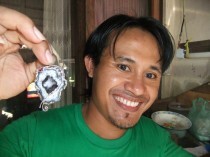 He’s 33 years old, married with 2 children and has practiced silverwork for 18 years. After working for most of those years in production factories for a basic monthly wage, Made took up our offer to become a member of Blue Turtles’ team. Made has special talents – we had perceived that he had the talent and integrity to be responsible for his own production and his own future, so we gave him the support he needed to set up his own workshop at home. Made hasn’t let us down – he’s an excellent, productive artisan who happily maintains the high standards we expect, and he now produces exclusively for Blue Turtles. Made now enjoys the freedom of working from home, earning a greater income and being his own boss. We’re often asked why we chose to call ourselves Blue Turtles. Turtles are, in many cultures, a symbol for the Life of the Earth. They represent creativity, tenacity and longevity. The colour blue is associated with trust and stability, wisdom and truth, tranquility, consciousness and healing. These are all noble qualities that are important to us – they represent what we want both Blue Turtles and ourselves to embody. We truly care about giving you something that you can be enamored with, and proud to own. This is why we’re driven to produce jewellery of superior quality, and why we’re committed to take responsibility for our work. Blue Turtles’ Lifetime Workmanship Guarantee covers your jewellery piece for any defect in manufacture that comes to light any time after purchase. Find out more about our Lifetime Guarantee.